BSB, Squarials and all that! Just in case you don't have a clue what this is all about, I'll explain. 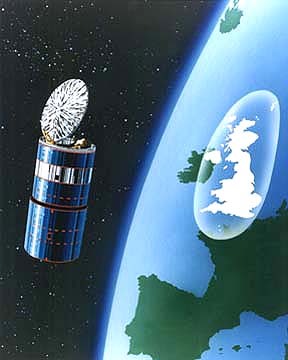 Around 1990 there were two competing satellite systems available in the UK. 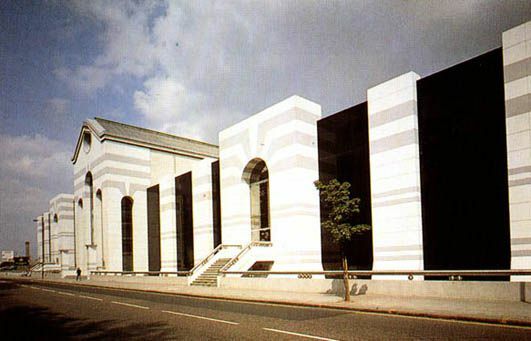 The "official" one, backed by government legislation derived from recommendations from the IBA, was BSB (British Satellite Broadcasting). Two BSB satellites were launched (Marcopolo 1 and 2, at 31 degrees West), one as a backup, providing just five channels in high quality DMAC format. 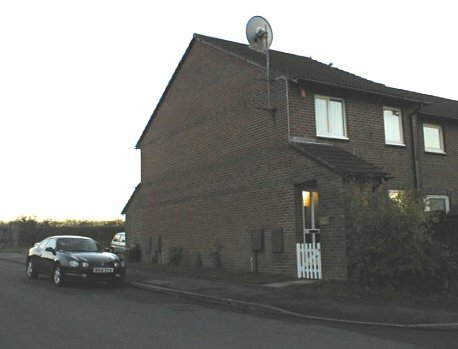 But Sky had stolen a march on BSB using cheaper, simpler PAL transmissions from an Astra satellite at 19 degrees East. Both companies lost money like it was going out of fashion, and eventually they "merged" to form BSkyB. In reality Sky bought out BSB, and shut down the transmissions. The satellites were sold, one became "Thor", transmitting technically similar D2MAC signals to Scandinavian countries, the other the other was known as Sirius and placed at 5 degrees East. Sirius 1, defunct since 2003, was owned by Sirius Satellite, a division of Nordic Satellite AB, and transmitted basically to Sweden. Marco Polo II was bought in 1992 by Tele-TV, a daughter company of Televerket, the Norwegian governmental phone company, who renamed it "Thor". In 1995, daughter and mother renamed to Telenor CTV and Telenor respectively, due to privitisation. "Thor" was moved to 1 degrees west and later renamed to "One West", because they (Telenor CTV) thought the satellite television market would digest that name more easily. It's a shame that neither Telenor CTV or Telenor Satellite Services have their own web sites, but you can find lots of info by searching around on http://www.telenor.com/ You'll find some brief history of Thor and its future with Thor II and Thor III, by going directly here. It's a brief history of the Telenor emporium as a whole. I don't know who bought the Marco Polo I ("Sirius"), but if you get hold of some corresponding info on it, it would do nicely as an extra piece of interesting reading on your site. The two satellites were in service (or later as backup service) as Thor 1 and 2 until 2002 and 2003, which was slightly longer than their design life. This was quite an achievement considering they were moved from 31W to 0.8W, which will have consumed some fuel. Some strange effects came from the merger. One was that once the announcement of the merger was announced, BSB receivers could be bought from surplus dealers at massively discounted prices. 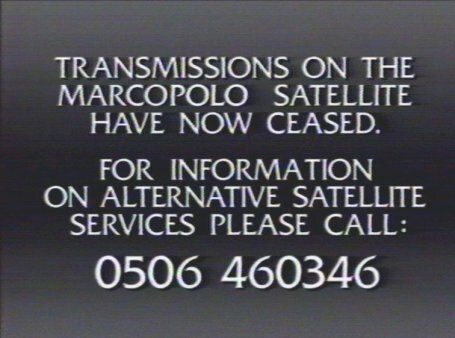 These were useful for receiving satellite programs, Sky ones of course, from the Marcopolo satellites during their remaining "life" until 31st December 1992. At one point in 1992, there were some 2000 BSB installations being initialised by BSB every week. If it had been this successful before the merger, history may have taken a different turn! The day it all ended for BSB, 31st December 1992. What was rather sad about all this was that the BSB system was quite nice. Picture and sound quality from the DMAC transmissions was excellent, and the dishes used were very compact, either small 28 or 35cm dishes or Squarial flat plate antenna. But the system was late launching due to technical difficulties with the complex DMAC chip sets, and also with manufacture of the Squarials. Looking back on it, the five channels expandable to ten, probably was never enough. BSB had rather over spent. Two satellites for five channels probably was overkill. BSB's Marcopolo House studios were purpose built, which was perhaps not money wisely spent. These studios were later home to QVC and ITV Digital (who also lost out to Sky), what a come down! The building was (wastefully) demolished in 2014. A writer in 2011 told me "I was part of a team that set up a tv production company that made programmes for the NOW Channel on BSB. WE set up studio/editsuites/offices in a building once used to turn round trams in Fulham, no budget for BBC engineering standards but effective. We sometimes used BSB studios, designed by Ellis Griffiths, great studios but no Green Room for guests and no parking for visitors. You changed the room temperature via the phones." Reception was targetted over the UK as can be seen from the satellite footprint (though this image is probably more for show than the actual footprint which would have been wider). Technically, the D2MAC signal gives better performance that the PAL signal used by Sky analogue, and normal analogue TV signals in the UK. 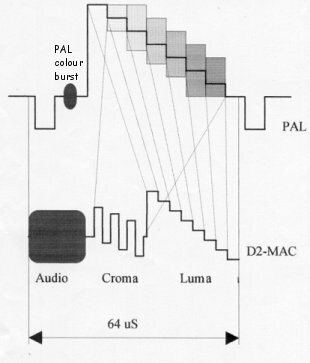 The sound is digital, based on Nicam, and the chroma (colour) content is split off from the luma (brightness) rather than being mixed in with it as PAL. This diagram shows what a colour bars test card would look like on an oscilloscope, for PAL and the superior D2MAC. This is taken from a web page and translated to English. DMAC as used by the original BSB transmissions would look broadly similar to D2MAC. Virtually all D2MAC conversions include a Eurocript card slot. Now this is a potentially thorny subject. In the UK, few if any legitimate Eurocript cards are available. What people use are pirate cards, usually based on one or two PIC16C84 chips or similar. If the transmission "codes" are changed, these chips can be reprogrammed by many satellite shops or by the user using a simple add-on to a PC, as shown here. What's wrong with this? Well, at the moment it is still quite legal to view transmissions in this way, since the legitimate cards cannot be purchased in this country. By the way, the programmer pictured here, which requires just a unregulated 12V PSU and a parallel port on a PC in order to use, is for sale if someone would like to buy it off me for £12 inc UK post. I've only got the one, mind you! It's based on this diagram, which I downloaded from somewhere years ago, so I'm sorry it is not acknowledged. Here is a fairly typical D2MAC conversion in use. A Philips STU902, converted to D2MAC by TRANSWORLD, sitting atop a Pace MSS1000 receiver with positioner fitted. Outside a motorised dish is pointing at 1 Degree West, from where TV1000 is transmitted. 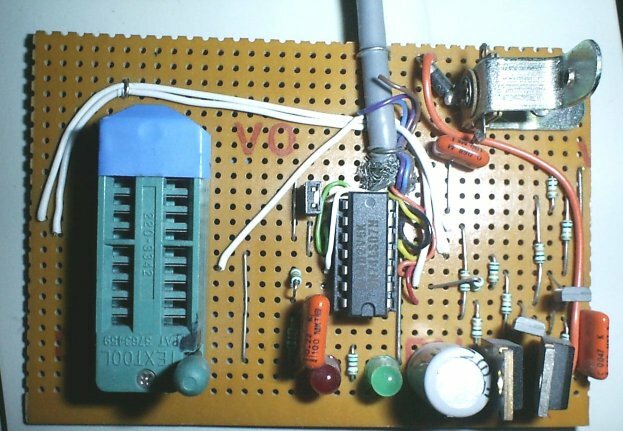 The blue board projecting from the front of the Philips STU902 is a decoder card, containing a PIC16C84 chip. It is not brilliant, but it usually works. If your Philips STU902 should cease to work one day, emitting a faint hissing noise from the power supply, unplug it immediately. Visit Satcure and order the power supply refurbish kit for the STU902 called RELKIT29 from my old pal Martin Pickering. Carefully fit all the parts in that kit, you may need to get a repair company to do this if soldering is not your thing (but it's not too difficult). Your receiver will now be fixed and should keep working. What to do with a BSB dish or Squarial flat plate antenna? Don't bin them either, though they are less useful than the receivers. The problem is that there are very few signals available in the UK that could be received with such a small antenna. Most (but not all) Squarials can be dismantled, the plastic sheet turned over, and reassembled, which will change it from right hand circular polarisation to left hand, suitable for reception of some of the transmissions from Hispasat satellites. 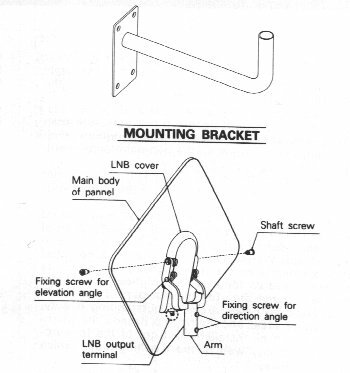 The cone of a BSB compact dish LNB can be pulled off and the white plastic cone underneath rotated to achieve the same result. Squarials are often wanted by collectors, I used to sell them at £15 each but now they have all gone. Perhaps I should have charged more! Shortly after the cessation of BSB transmissions, BSB receivers were often converted to D2MAC and used with their original dish or Squarial for reception of French transmissions from the TDF satellite at 19 degrees West. However these transmissions ceased due to falling subscriber numbers and dreadful technical problems with the satellite. There are not any transmissions that can easily be picked up in the UK in this way any longer, though a few parts of the North East of the UK could just get enough signal from Thor (the ex-BSB satellites themselves!) while they were broadcasting. In the future, more powerful transmissions may again return to the UK which will allow more use to be made of ex-BSB dishes and Squarials. Anyone tried receiving Astra digital signals on a Squarial? If so, let me know! 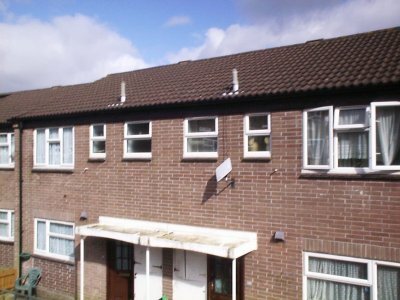 A Squarial is really quite compact when installed. Coming soon: Sales literature for BSB sellers and installers. Some links on and around the subject of BSB satellite receivers. I have a collection of video clips of BSB intros here, please do have a look at these! After BSB's merger with Sky, this video made by the newly formed BSkyB talks about wha they are doing in late 1990's. TRANSWORLD, who can convert receivers to D2MAC and may buy unwanted receivers. Chris Evans (ugh!) on the Power Station can be seen on this page. The last programme line-up from Sirius1 and Thor1 (Ex-BSB satellites) and more information on their last transmissions. Everything to do with satellite equipment, see the Satellite Superstore. Brymar do a great selection of equipment for analogue and digital satellite reception. To my Beta (Betamax) Video page, Pictures of Plymouth, my Hillman Avenger page, Hifi system, or my Virtual Loft full of stuff. 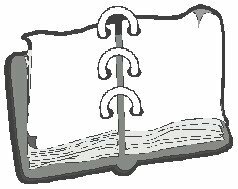 My guestbook: ReadMy Guestbook! | SignMy Guestbook! I like to receive friendly email from nice people! Spam does not get through.